What Do Lice Eggs or Nits Look Like? Both parents and kids look forward to summer camp. However, a summer at camp where kids spend lots of time in proximity to others can means getting exposed to head lice. And if your kid’s camp doesn’t screen campers for lice, it’s smart to make sure your camper knows how to avoid getting head lice. They should know how to avoid close proximity to cabin mates such as sharing clothes, towel or even having pillow fights. Being close and sharing personal items would be okay if only head lice didn’t love it when people are in close contact within limited space that gives them the chance to move from one nice clean head to another. They love crawling from one pillow to another, from one camper’s hair brush to another’s hair or from one kid’s sports helmet to another kid’s head. What Does a Lice Egg Look Like? Show your kids a picture of a lice egg or nit so they know what to look for. Lice nits or eggs are oval-shaped and about the size of a knot in thread. They're often very hard to see, but if you run a fingernail down the hair shaft from the scalp you can feel them. Nits can be light gray, tan, yellowish, or white. They can look just like a grain of sand or a tiny sesame seed. What If You See a Lice Nit? If it turns out that your kids see live louse or their eggs on themselves or another camper, it’s likely that many others may also be infested. If that’s the case, it’s important to notify the camp nurse or counselor so they can arrange professional lice check and treatment as soon as possible. If live lice are left untreated in the hair, they can lay thousands of nits (eggs) in the hair and the more nits they lay, the more severe and widespread a lice infestation will become. Even one lice infestation at a summer camp can disrupt carefully planned camp programs and require camp-wide head checks to prevent further infestations. Most of the emergency calls Lice Treatment Center® gets in the summer are from sleep-away camps. Within a few hours of an emergency call, LTC will dispatch teams of technicians to provide on-site lice treatments. 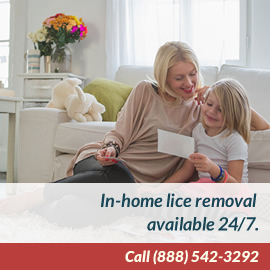 All LTC’s physician-trained lice technicians are discreet and empathetic professionals. The technicians will also inspect the heads of everyone in the camp believes at risk to evaluate the level of infestation in the camp. The technicians will provide lice treatments for anyone identified with nits or live bugs. LTC’s professional lice removal process plus careful aftercare and screening by the camp staff will ensure highly-effective lice removal and avoid further infestations at the camp. For information about LTC® call (888) LICE AWAY/(888) 542-3292 or visit www.licetreatmentcenter.com.